Not to be confused with United States Senate special election in Pennsylvania, 1909. 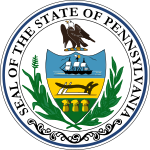 The 1909 United States Senate election in Pennsylvania was held on January 19, 1909. Boies Penrose was re-elected by the Pennsylvania General Assembly to the United States Senate. This was the last Class III U.S. Senate election to be decided by the Pennsylvania General Assembly before the ratification of the 17th Amendment to the U.S. Constitution, which mandated direct election of U.S. Senators. ^ a b "U.S. Senate Election - 19 January 1909" (PDF). Wilkes University. Retrieved 22 December 2013.